It might not sound like much, but doubling the speed of memory access really counts. Research into new forms of digital storage is always at something of a crossroads, with technologies like yesterday's phase change memory jostling for attention with dozens of other breakthroughs at any given time. 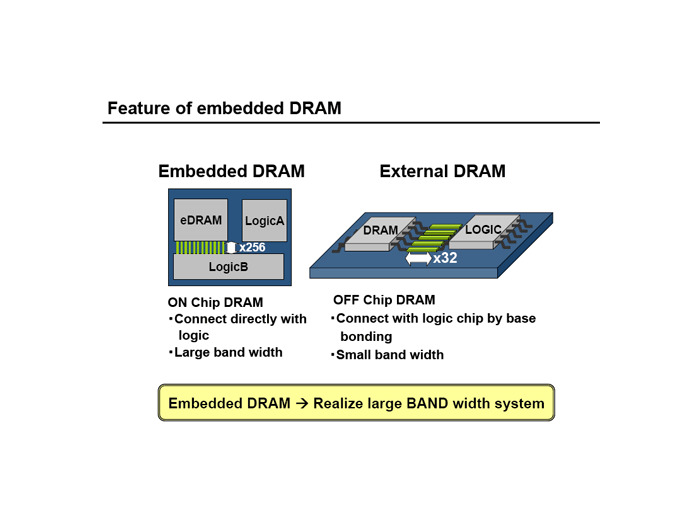 The latest 'look at me' memory development comes from Toshiba Japan and promises, apparently, the world's fastest embedded DRAM. Although "a speed of 833MHz at 32Mb density" might not sound like much, it's the way the chip controllers address the memory that makes a difference. A new 'pseudo two-port system' treats the chunks of memory as two separate entities and reads and writes to them in parallel instead of the serial method that takes twice as long. The new faster memory will be most beneficial in graphics-intensive applications, such as processing high-definition video and still images. Accordingly, we can expect to see it in cameras, phones and handheld games machines.